Raumfahrt+Astronomie-Blog von CENAP - Blog: Astronomie - Impact on the Moon! 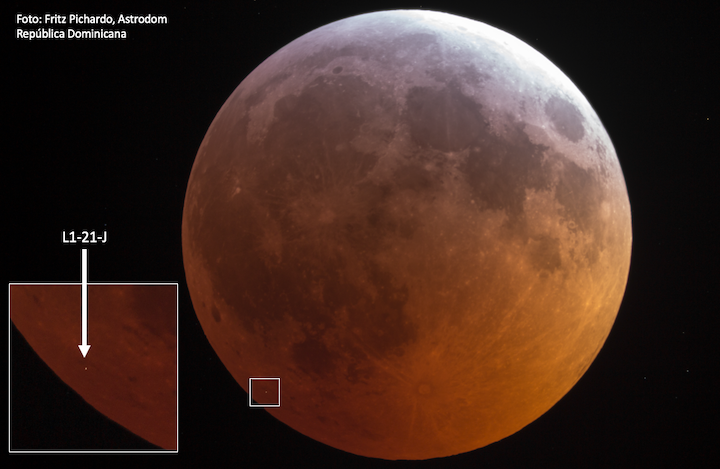 Last Monday, January 21, 2019, the only total lunar eclipse of this year took place. The eclipse was visible from the entire American continent, northern Africa and much of Europe. It is estimated that one in four people living on the planet could see this astronomical phenomenon that occurred in the middle of sunday night (for America) and in the early monday morning for Europe and Africa. But this eclipse was special compared to others recorded and observed by millions in previous years. Towards the beginning of the totality (when the Moon is completely covered by the shadow of the Earth), observers following the phenomenon on the Internet (today events such as these are transmitted online) or watched it directly with their own gear, announced in on-line forums they had observed a brief luminous flash near one of the edges of the Moon. Immediately the alarms went off for some of the professional astronomers around the world hunting this type of lunar events. One of them is José Madiedo from the University of Huelva in Spain, who directs the "Moon Impact Detection and Analysis System" (MIDAS). Shortly after the announcement on social networks, Professor Madiedo checked the data of the MIDAS system and verified what was rumored on the Internet: something had impacted the Moon while millions watched the eclipse that night. Just as in many parts of the American continent and Europe, in Colombia and the Dominican Republic, hundreds of enthusiasts were recording at that moment, both on video and still images, the beginning of the eclipse. In San Vicente Ferrer (department of Antioquia, Colombia), a team led by Mauricio Gaviria (director of the LaLoma observatory, equipped with the largest telescope in Colombia, a 63.5 cm aperture reflector) and Jonathan Ospina, a renowned expert in astrophotography and astronomical equipment of the city of Medellín, registered, without noticing it at the time, the impact against the Moon. Meanwhile, in Santo Domingo, Dominican Republic, Fritz Pichardo, a well-known astrophotographer and member of the Dominican Astronomical Society (Astrodom), took pictures of the event from his home observatory using the various telescopes he owns. Also unknowingly, He registered the impact in at least one of his images. captured by the camera of Fritz Pichardo in Santo Domingo, Dominican Republic. Astronomers of the University of Antioquia, led by Professor Jorge I. Zuluaga, co-founder of the undergraduate program in Astronomy from the same University and who in 2013 analyzed the images of an impact on the Earth's atmosphere captured by surveillance cameras in Russia , were immediately interested in the announcement that the lunar impact had been recorded by enthusiasts in the Dominican Republic and Colombia. In less than a day, a team was organized, made up of both professionals and amateurs from both countries, who aimed to carry out one of the first scientific analysis of the event. On January 28, 2019, just one week after the impact, their results were made public in the arXiv (a database of scientific manuscripts in preparation or published). Their work has also been submitted for publication in a peer-reviewed journal. The impact, naturally, is of great scientific interest. Although the Moon is "hit" permanently (it is estimated that every hour a small piece of space rock hits its unprotected surface), the fact that this impact occurred in the middle of a phenomenon observed by millions, offers a unique opportunity to study it in detail. "Something like this probably did not happen since the 12th century when a group of English monks observed together what they described as fire, hot flashes and sparks" says Professor Pablo Cuartas, co-founder of the Astronomy undergraduate program at the University of Antioquia and one of the coauthors of this work. He adds "Although on this occasion the impact did not have the energy of the middle-age impact, it was enough for astronomers and enthusiasts of the world to get excited about the event." The analysis of the images (which also included a video captured by a mobile observatory of the renowned website timeanddate.com and which was on this occasion in the city of Ouarzazate, Morocco) revealed the first clues about the origin and nature of the object that impacted the Moon. 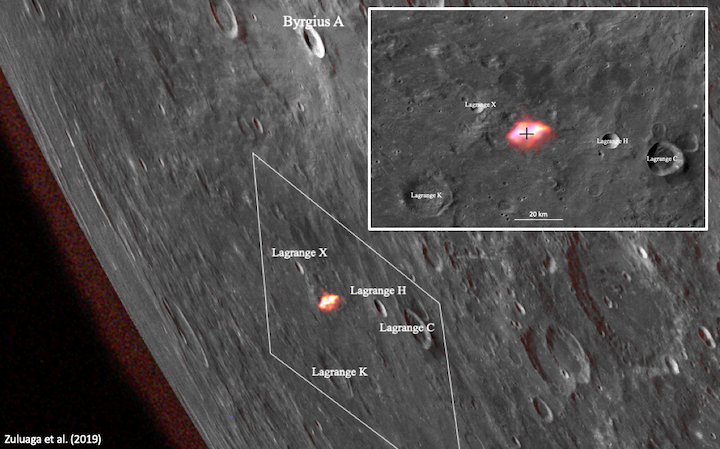 According to the Colombian and Dominican astronomers, the flash of light observed on the Moon was produced when a meteoroid ( the technical name for these rocks) about the size of a small ball (10-27 cm) and a mass between 7 and 40 kg crashed into the surface of our satellite at a speed of around 47,000 km/h. The impact produced a cloud of hot, bright material that expanded rapidly and disappeared in less than a third of a second. If the estimates presented are correct, there must be a crater more than 5 meters in diameter where the impact took place could be observed in the future by a lunar prospecting probe. Karls Peña, member of the Dominican Astronomical Society and coauthor of the work, points out that "social networks and easy access to technology, have brought humanity closer than ever to science (especially to non-experts)" and he adds "efforts like this, in which professionals and amateurs from different places work together for the advancement of human knowledge, are a very effective way to awaken interest in scientific research in our youngsters". Talking about the astronomy development in his home country, Peña comments how this work "offers a unique opportunity to the Dominican Republic, which has a vibrant and active amateur astronomy community, to contribute their bit for the development of astronomy". One of the differentiating elements of this work was the use of a novel technique to study the origin of impactor objects in the solar system, developed by Professor Zuluaga and his then Doctorate student, Mario Sucerquia. The technique, known as "gravitational ray tracing", which is inspired by the methods used to create photorealistic images in animated films, allows us to calculate the probability that the rock has arrived from a certain direction in space and with a certain speed. It was precisely this way that they estimated the speed of the rock hiting the Moon (which is normally assumed as an average of that of all the rocks that hit the Earth and our satellite). As an additional result, the Dominican and Colombian team estimate that the impactor, could have had an inner orbit to Earth's (such as that of an asteroid group known as the Atens) and it would have rushed towards the Moon from the direction of the Scorpius constellation or from some point in the constellation of the Chisel. Unfortunately it is not possible to verify these particular results (due to its small size there is no record of the rock as it approached the Moon). Even so, the possibility of learning so many details about the phenomenon is a great display of the capabilities of the ray tracing technique developed by the researchers at the University of Antioquia. In the following weeks and months it is expected other teams of professionals around the world, including Madiedo’s team in charge of the MIDAS system, publish their own results and confirm or modify the predictions of the Colombian and Dominican astronomers. 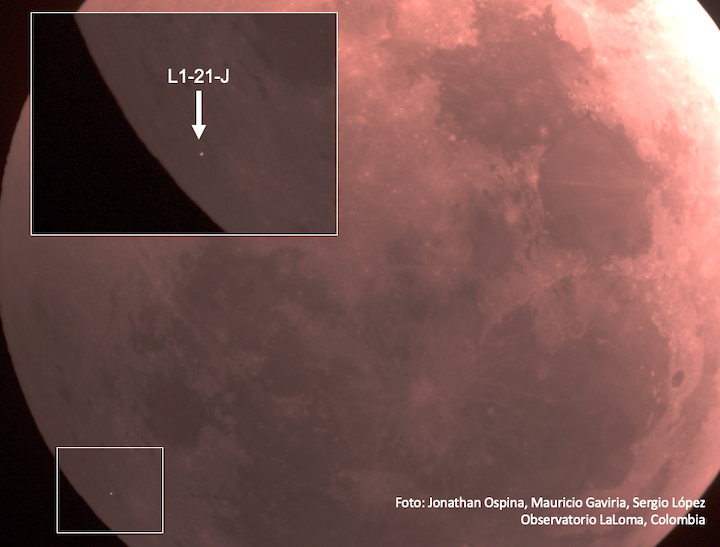 "At the University of Antioquia we have promoted science made with and by the public, and this case was no exception" recalls Professor Cuartas, adding "we work together with enthusiasts to try to tell the wonderful story of this new impact on the Moon". Sergio López, Colombian engineer with an Astronomy Diploma and coauthor of this study, pointed out: "I believe scientific exercises like this are of inestimable value in teaching new generations of scientists and also send a message to the public that not being a professional researcher on the field does not constitute an insurmountable impediment to make a small contribution to this human collective enterprise which we call science"
Accurate location of the impact on the Lunar surface (red spot) determined by the team of Dominican and Colombian astronomers. "Thanks to the feedback received from other colleagues, we found a small mathematical mistake that we corrected in the last version of the manuscript. This mistake does not modify substantially the conclusions of our work but the value of the mass and size of the object and crater diameter were modified. Instead of 20-120 kg, it would be 7-40 kg. Instead of an object diameter of 20-50 cm, it would be 10-27 cm. The crater diameter, instead of 7-15 meters, should be 5-10 meters. Changes are highlighted in red. The corrected manuscript is available in this link and it will be available in the arXiv soon (version 3)". Data and software developed for the work:: https://github.com/seap-udea/MoonFlashes. About the Gravitational Ray Tracing method see the press release "Where will be the next 'Chelyabinsk' event?". Zuluaga, J. I., & Sucerquia, M. (2018). Towards a theoretical determination of the geographical probability distribution of meteoroid impacts on Earth. Monthly Notices of the Royal Astronomical Society, 477(2), 1970-1983 [doi: 10.1093/mnras/sty702].